when calls from Capitol Hill for the U.S. to halt arms sales to the kingdom after the murder of a Washington Post journalist rang out. Governments around the world are condemning Jamal Khashoggi's brutal murder by the Saudis. Trump is between a rock and a wall. Lawmakers are livid that Saudi Arabia sent a hit squad after Khashoggi for his controversial views on their government. Congress is demanding to know if the columnist was killed inside the Saudi consulate in Turkey. Trump, who has private business deals, and presidential stakes in the kingdom, is doing everything he can to tamp down the controversy. The Turkish government has already provided proof of what happened to Jamal Khashoggi. The next move is Trump's. His reaction to irreversible facts will be watched by the American people and the world. To be sure, Congress has been concerned about Saudi Arabia's policies and the crown prince's aggressive steps to silence his critics for over a year now. To Trump's dismay, lawmakers are considering halting a arms sales (that Trump bragged about in his visit to Saudi Arabia) to the kingdom. Furthermore, there is a push in Congress for sanctions to imposed against the Saudis for human-rights violations. They're questioning America's support for a Saudi-led bombing campaign against Iranian-backed rebels in Yemen. 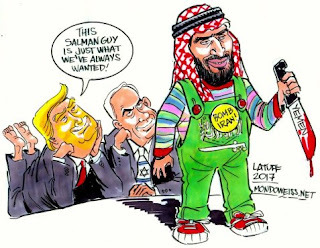 Least we forget, Trump's business relationships with the Saudi government - and rich Saudi business executives-go back to at least the 1990s. Trump has a lot of irons in this growing firestorm showdown with Congress. He's going to be politically forced to make some hard decisions. Expect a spin that will challenge reality.